Robin van Leeuwen sent me these photos of jump wings with a skull on them. These would have belonged to a pathfinder of the 101st, although no name was provided. 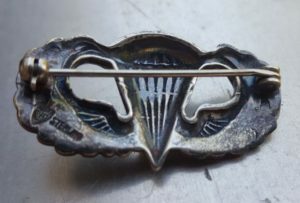 The wings look fine with the NS Meyer hallmark at the back, and the clasp looks good too, but what stands out to me is how smooth they are and how they seem to have been lacquered with some kind of varnish. I don’t think these are a recast though, because those are generally solid at the back, whereas these are hollow. It’s impossible to tell when the skull device was added. I have no documentation on this type. 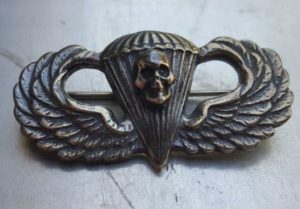 I have found information about this practice during the Vietnam war, but I think these are WWII wings. So any further background on this type of wings are welcome.